Janus, the god of beginnings and endings, his two-faced image decorating temple gates in ancient Rome, was a natural choice for biologists naming this strange new enzyme. For reasons imperfectly understood, this Janus Kinase, this JAK protein was able to both open and close vital organic processes including the production of blood. A trio of recently published scientific papers has created an emerging portrait of the hidden face of the JAK2 kinase, the mutation of which has produced untold misery including myeloproliferative neoplasm. Sailing within the cellular cytoplasm, the Janus kinases – JAK1, JAK2, JAK3, and TYK2 – are linked double worlds: the kinase itself, JH1, whose job is to activate molecules (phosphorylating) through addition of a phosphorus element; and JH2, a pseudokinase whose function has been largely unknown until recently. Joining this double JAK world is a thin leash of 30 or so amino acids also largely disregarded. Recent discovery that all the JAK2 mutations causing MPNs congregate at the pseudokinase gate at the end of that leash may have refocused attention on this juncture. The JAK kinases remain inactive until signaled by a cytokine arriving at the cell’s surface. Typically, the JAK2 kinase autophosphorylates – turns itself on – and activates receptors on the cell surface. These produce specific cytokine docking sites. In actuality, JAK2 kinases act in pairs (dimers) and one JAK2 kinase may phosphorylate and then activate the other. The JAK2 enzyme then phosphorylates a STAT (Signaling Transducer and Activator of Transcription) molecule that in turn activates another STAT molecule. This joining of monomers is dimerization. The JAK2 enzyme then dephosphorylates freeing the dimerized STATS to translocate into the cell’s nucleus and convey the order to express the appropriate genes that initiate the protein production process. A cartoon version of the way JAK2 works. It provides a useful chronology of events while masking the hidden face of the Janus kinase. In the past decade, billions of dollars have been poured into drugs targeting the active JAK kinase in an effort to inhibit the effects of runaway MPN blood production – splenomegaly, fatigue, cachexia, hepatomegaly, pruritis, myelofibrosis and death. The common drug development strategy: Bind the active JAK kinase. Ruxolitinib, FDA approved in 2011, proved successful in ameliorating the worst of symptoms and improving QOL without affecting the JAK2 allele burden or the underlying disease. Ruxo, along with JAK2 inhibitors in clinical trial –e.g., SAR302503, CYT387 – targeted the energy pocket, ATP, in the active kinase. Drug designers reasoned that Type I inhibition, blocking the active JAK2 kinase’s ability to phosphorylate, should shut down the impact of the JAK v617F mutation. And for a time, until JAK2 successfully resisted inhibition by recruiting other JAKs to complete its dimer, this approach worked in many myelofibrosis patients. It also produced severe anemia and thrombocytopenia side effects. And eventually lost effectiveness. CHZ868 is a Type II JAK inhibitor that binds JAK2 in its inactive state. In animal and tissue studies, CHZ868 was effective in overcoming JAK2 cellular resistance to ruxolitinib and similar Type I JAK inhibitors. It preferentially targets the JAK2 V617F mutated cells versus the wild type JAK2, suppressing JAK signalling and proliferation of mutant cells and induces cellular death of mutated JAK2 cells while reducing overall allele burden in murine MPN models. Type I JAK2 inhibition, stabilizing the kinase in its active phosphorylated state by cutting off access to ATP, does block the kinase function but also increases activation loop activity. In the effort to reduce excess blood production this is a bit like putting on the brakes while pressing the gas pedal to the floor. Many of the drawbacks of this Type I inhibition of mutated JAK2 appear to be minimized or eliminated altogether by targeting the inactive kinase, Type II inhibition. Stabilizing the inactive state of the JAK kinase leads to a loss of activation-loop phosphorylation. The JAK2 activation loop — a polypeptide region in the activation segment that is outside the active site – is turned on through phosphorylation. When deprived of phosphorus, the activation loop acts as an autoinhibitor by blocking tyrosine substrate access to the active site. Once phosphorylated, the loop releases the autoinhibitor mechanism and allows substrate binding and subsequent catalytic action of the active kinase. Here’s the JAK2 activation loop in contact with the v617F mutation. Catalytic activity regulation by the loop. The dephosphorylated activation loop can act as an autoinhibitor by blocking substrate access to the active site. Phosphorylation of the loop could then release the autoinhibitor from the active site, allowing substrate binding and catalysis. Molecular model of the autoinhibitory interaction between the pseudokinase domain (JH2) and the kinase domain (JH1) of JAK2. Select MPN mutations are shown in pink, and the location of the predominant MPN mutation in JH2, V617F, is shown by the arrow. The activation loop of JH1 is colored red, the linker between JH2 and JH1 is colored gray, and the linker leading into JH2 is colored green. 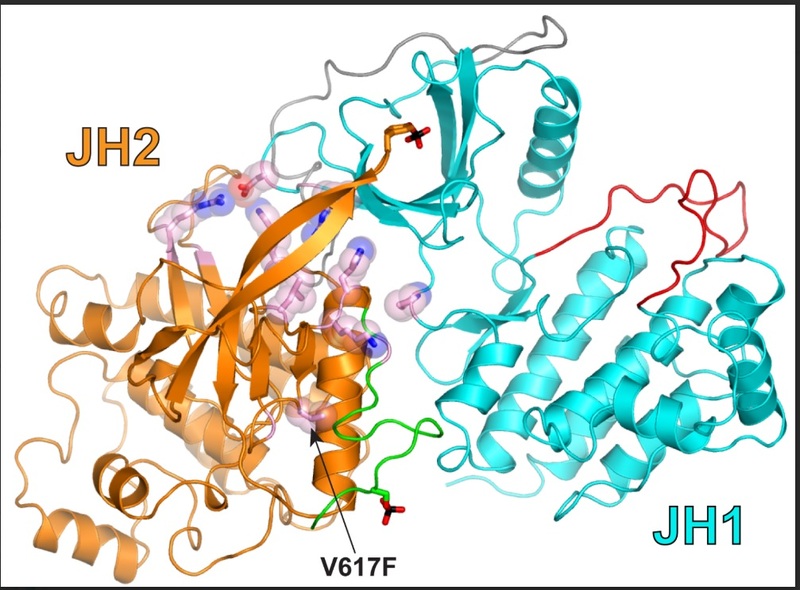 The two phosphorylation sites in JH2, which help maintain the autoinhibitory state, are shown in stick representation, with the phosphate group colored red (oxygen) and black (phosphorus). Following a different path, Stevan Hubbard (Skirball Institute, New York University), Olli Silvennoinen (University of Tampere, Finland) and their associates explored the molecular underbelly of the JAK2 linked worlds. In the process they appear to have uncovered critical inhibition functions of the pseudokinase through structural regulation of JH1 by JH2. Through a novel molecular-docking simulation, Hubbard and his colleagues determined how the pseudokinase domain interacts with the kinase domain to inhibit the latter. Nearly all of the mapped MPN disease mutations were found in or near the interdomain interface. The impact on pseudokinase inhibition of the kinase is significant. The major way the pseudokinase inhibits the kinase domain is through physical interaction with the kinase. The pseudokinase isn’t completely “pseudo” since it does have some residual catalytic activity. And by phosphorylating one or two sites on the pseudokinase, the pseudokinase domain helps maintain the physical interaction between the two JAK2 domains. “If you have a mutation in that interface that weakens the interface – destabilizes the interaction between the kinase domain and the pseudokinase domain – that frees up the kinase domain to wander off from the pseudokinase domain and phosphorylate other proteins, like other JAK2 molecules. The TYK2 JAK kinase study that confirmed Hubbard’s simulation was the experiemental work of a Genentech group (Lupardus, et. al, op.cit.) Through x-ray crystallography of the two domain JAK family structure… uncovered an inhibitory interaction interface between the two domains. The MPN mutations found in JAK2 map to this inhibitory interaction site causing activation of the kinase. Conclusion: Successful Type II inhibition of the inactive state of the kinase domain with CHZ868 opens consideration of the attached pseudokinase domain and its role in regulating activity within the JAK2. 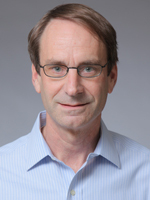 Dr. Stevan Hubbard’s Lab at NYU approached this process from elucidation of the structural biology of the JAK2 while the Genentech group, Lupardus et al., independently and experimentally confirmed the role of the pseudokinase in inhibition of the JAKs. Taken together, these three papers advance our understanding of the dynamic at work in the interrelationship of the JAK domains and point to future therapeutic targeting options. A VIDEO PRESENTATION OF THE FUNCTION OF THE JAK2 PSEUDOKINASE BY PROFESSOR OLLI SILVENNOINEN.